The Poole Festival of Running Charity 5k has a flat, harbourside course with a fantastic atmosphere! The Poole Hospital Charity have been chosen as the nominated charity for this year’s Poole Festival of Running and they would like to thank everyone for their support. Minimum Age is 13 on day of race. 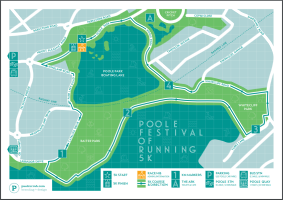 The 5k route is a scenic, fast and flat course which starts and finishes in Poole Park. Due to the confines of the course, the event is not suitable for wheelchairs, pushchairs or buggies etc and please – no dogs. Athletes must not be accompanied or followed by others on cycles. 6:30 pm in Poole Park (close to the marquee). Please assemble from 6:15 pm in your estimated finishing time zone. There will be time boards to assist you. Poole Hospital Charity have been chosen once again as the nominated charity for Poole Festival of Running 2018.